Several years ago I wrote about a spectacular illuminated book called Tres Riches Heures du Duc de Berry. It was a Book of Hours created for a French Duke in the 15th century filled with prayers, calendars, timetables and the like. It also included some of the most extraordinary paintings that illustrated the text, including twelve pages that showed each month in proper seasonal context. I came across the film below that focuses on these beautiful pages, showing them in some detail. After hitting the start arrow on the video below, you have to click on the link to go to YouTube to watch the video at the request of its creator. But it’s well worth a look to start out your week on such a calm and lovely note. One of the great pleasures in being fairly ignorant is the thrill that comes from stumbling across something that is absolutely spectacular without any knowledge of its existence beforehand. Of course, the flip side of this experience is the depressing realization that sets in when you realize how little you really know. I know this from experience. 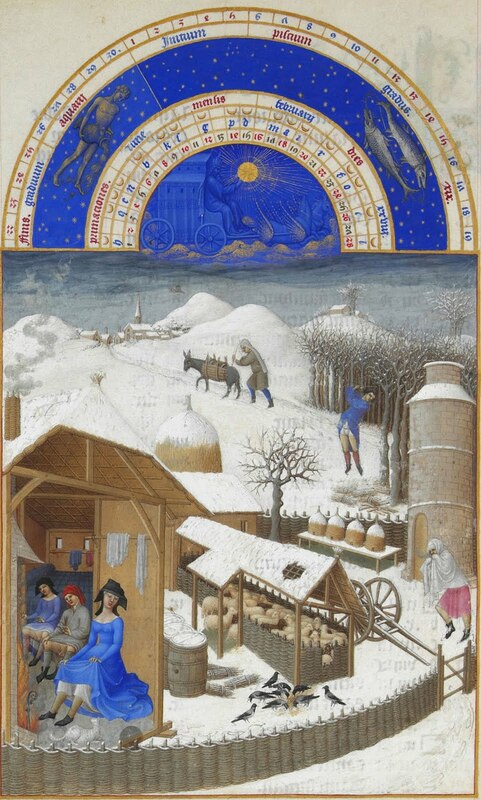 The other day, while searching for images of medieval snow scenes for the previous post, I also came across a beautiful image taken from a 15th century illuminated manuscript called the Tres Riches Heures. It was a gorgeous winter scene, very Dutch looking, with a astronomical chart with beautiful blue lapis bands arching across the top of the page. I was immediately taken in by the image. 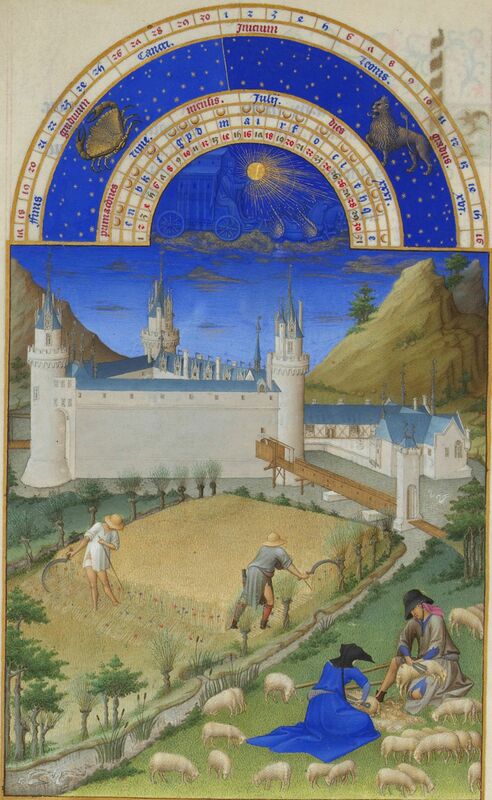 Doing some quick research I discovered that this image was but one of over 130 painted images in the Tres Riches Heures, many of which were done by a trio of Dutch siblings, the Limbourg Brothers, between 1412 and 1416 for the French Duke du Berry. The Tres Riches Heures is a book of hours which consists of prayers and devotional exercises along with timetables for specific prayers and calendars for feast days and other days of note in the liturgical year, along with some customized additions. This particular book of hours was the most spectacular ever produced. Of course, something this incredible never comes easily. The Limbourg Brothers, unfortunately, all died within the year of 1416, most likely from the plague, leaving the Tres Riches Heures incomplete. It was worked on for many years by an unknown intermediate painter, most likely a court painter for French king Charles VII, who had attained the unfinished group work in the years after the Limbourgs died. 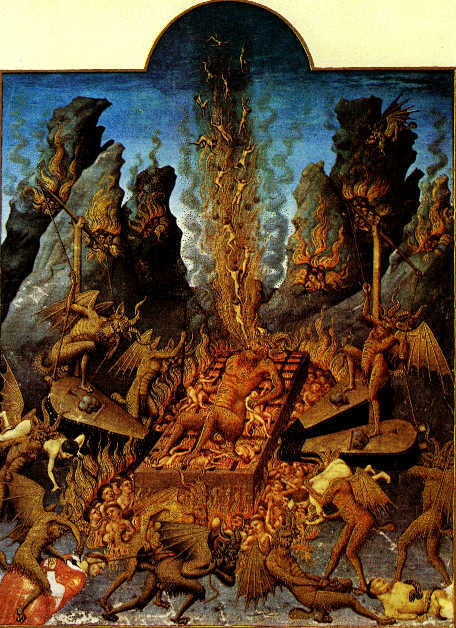 Finally, between 1485 and 1490, the work was completed by artist Jean Colombe. Today, this considered arguably the most valuable book in the world– a book filled with 130 beautiful Dutch paintings, a book that took nearly eighty years to complete. 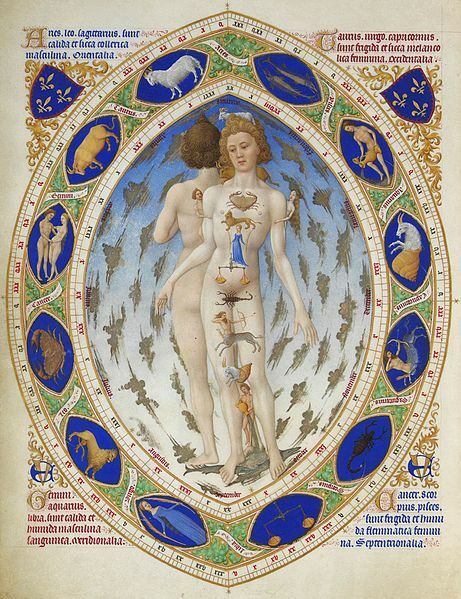 As I say, I was thrilled to come across it, having no prior knowledge of it or the magnificent work of the Limbourg Brothers or Jean Colombe. But then I was a bit taken aback by the realization that I had such a gap in my knowledge, especially of a work of such grandeur. But, that’s the way it goes. You trudge forward, a blind squirrel periodically stumbling across a nut. I remembered commenting on your earlier post about this. It’s great to see it again. What startled me is that five years have passed. Gracious. This is a treasure, and I’ve time to watch the video before heading off to work. Best of all, I get to watch it with the windows open and cool breezes wafting in — we finally have our first real taste of fall. So glad you’re feeling fall. It’s been pretty summery here and today is one of the few real fall days we’ve had. It’s wet but cool and refreshing. So good!